Layered outfits in the winter may not exactly be groundbreaking, but it’s important to ensure you aren’t compromising warmth for style. A thin, body-hugging turtleneck is a simple staple that can be worn with almost anything in your closet. Pair it with a summer dress to make it feel seasonally appropriate, or layer it under a chunky knit for double the warmth. 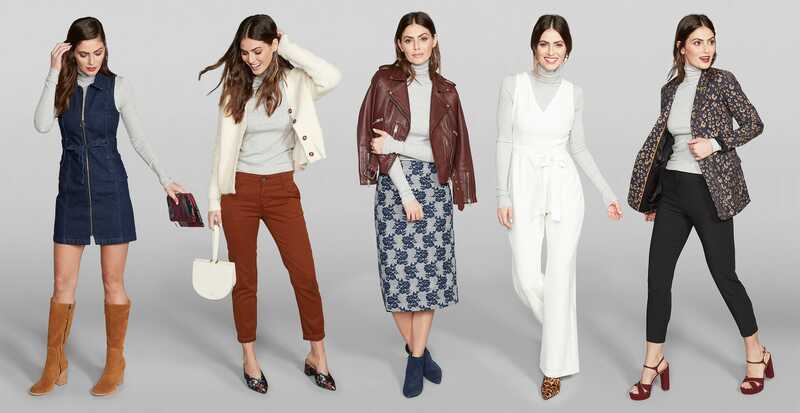 Still not convinced a lightweight turtleneck is as versatile as we say it is? Keep reading for five ways to wear it. If you have a dress that just didn’t get enough wear during the warmer months, don’t fret. Layer it over your turtleneck and then slip into some knee-high boots for a look that’s winter-ready. Complete the outfit with a contrasting clutch and modern earrings. A fuzzy sweater is incredibly cozy, but can also be chic—especially when you layer it right. Pop it over the body-hugging top and a boldly colored pair of chinos. (We love to give hems a slightly imperfect fold.) Finish the look with statement mules that pull shades from the entire outfit to bring everything together. Like the lightweight turtleneck, a pencil skirt is a wardrobe staple that never goes out of style. Choose one with an interesting texture, or one that features two contrasting colors, matching your top to one of the hues. Modernize the look with an edgy moto jacket with hardware detailing and kitten-heel booties. This outfit is proof that layering can be sophisticated, too. The turtleneck warms up this normally summer-y jumpsuit, creating a wintry-chic vibe that’s perfect for a holiday party. Add more festive details with printed booties and tasseled earrings. Did someone say happy hour? This is an outfit that can be taken from day to night. The shimmery printed blazer is suitable for the office, especially when worn with conservative footwear. Switch out your day shoes for block heels and a matching belt bag for a look that’s decidedly after-hours.